Foodmantra: I bet, no Chef in the world can cook as good as my Grandma cooks. I bet, no Chef in the world can cook as good as my Grandma cooks. Aren’t you really bored of going to an Indian restaurant and eating the same old makhani curry, the deep brown onion gravy and that same old cashew based white gravy each time? I have decided to try something new that is old. And who better to learn something old from, than your grandmother? I bet, no Indian restaurant in the world can match my grandma’s cooking and neither can they have as many recipes on their menu as my grandma used to cook. The best part of our grandmothers’ cooking is that they can actually serve you a different recipe every day of the year and still not run out. Like a magic wand, they spin around and with the same ingredients there is a brand new dish every day. Who would have thought that with nothing but some tomatoes and moong dal in the house my grandma could teach me a curry fit to be served to the King, well, if not the King, his ministers would relish the curry all the same. So here is a rare recipe from grandma’s kitty of culinary secrets. 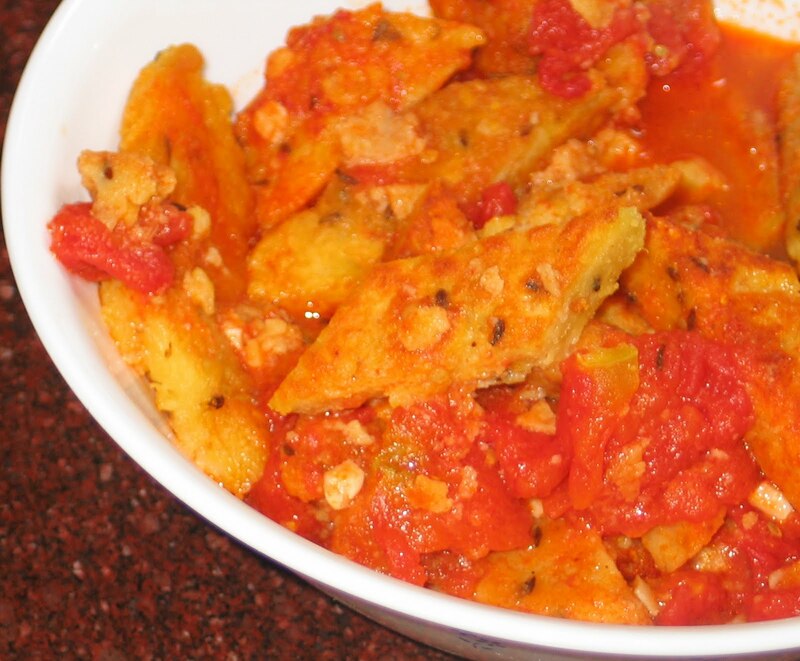 Grandma usually uses tomatoes with the skin, I have modified the recipe a little bit and added tomatoes without the skin. Soak the moong dal in water for an hour. Drain out the excess water and grind it with salt and ginger into a coarse mixture. Heat ghee in a pan, add cumin and ½ teaspoon asafoetida/ hing. Add in the coarsely ground moong dal mixture. Cook until all the moisture dries out and you get a thick, dry mixture. Grease a flat round plate with ghee. Spread out the entire mixture evenly on the plate to a ½ inch thickness. Allow it to stand for ten minutes. Cut the mixture into even size diamond shapes. 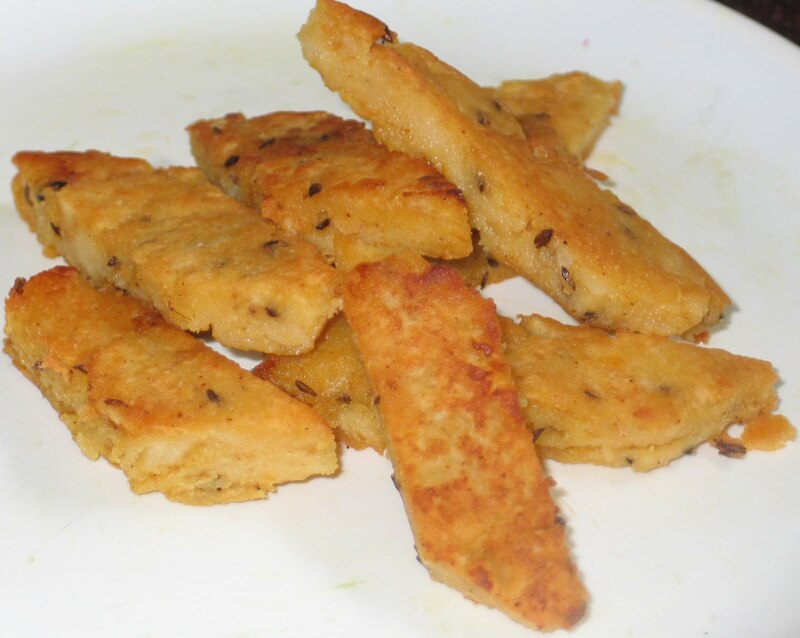 Heat ghee in a pan and shallow fry these diamond shaped moong dal morsels until golden brown. Set aside. Heat water in a deep heavy bottom pan until it starts boiling. Remove the eye of all the tomatoes, make a cross at the bottom and put the tomatoes in the boiling water for one minutes. Remove the skin of the tomatoes and then chop them finely. Heat ghee in a pan, add ½ teaspoon of asafoetida, chopped garlic until they turn golden brown, then add in the tomatoes, red chilli powder, coriander powder, stir in ½ cup of water and allow it to simmer for 10 minutes. Now, add the tamarind pulp and salt, stir and simmer for another five minutes. Add the shallow fried diamond shaped moong dal pieces in the curry, stir and served hot with pooris or any Indian bread.